When they’re held in cities, marathons take runners to places where they sometimes might not be able to go and might not usually be welcome. This partly explains why joggers love heading out in the early morning when the streets are quiet and a solitary sunrise awaits: the alternative, attempting a run during rush hour in Chicago’s loop, Paris’ Champs-Élysées or pretty much anywhere in Manhattan, is like a maddening live-action video game for everyone involved. 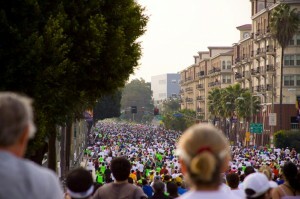 This Sunday, the L.A. Marathon will be held, celebrating its 29th edition. Runners begin in the hills of Elysian Park (home to Dodger Stadium), wrap around the downtown streets, take the famous Sunset Blvd. across the city, cut through the shop-lined streets of Beverly Hills and finish in Santa Monica on the shores of the Pacific. The views of cheering spectators and famous L.A. sights must be incredible. So how are runners prepping around town for the run? Lots of music, it turns out! Here are a few tweets of runners sharing their playlists and preferred songs to get pumped for the big event. Best of luck to everyone on Sunday. We’ll be cheering you on! My @lamarathon playlist has @nineinchnails Zeppelin @VOLBEAT @dvntownsend @PorcupineTree @foofighters & random songs. Other suggestions?